Just as vast new middle classes are being born around the globe, some are being buried. They are being buried by the people they elected to steward their economies, these public servants are more interested in their next reelection then coming up with practical solutions that meet today's challenges while preserving the economic futures of their current constituents and future generations. Today's middle classes in the western world have been taught a belief in two things: that you can have “something for nothing”, and that government can “protect and provide for you”. They now vote regularly for these chimeras/illusions. The growth cycle and bull markets in these ways of thinking are a self fulfilling vicious circle, which will culminate in the middle classes demise. This broad social trend is in the United States and in central Europe , and is as destructive a PRIMARY character flaw as I have ever seen, it is an investment theme for the next ten years or more as it plays out. The Banco de Espana's holdings of foreign currencies and gold have fallen to €13.2bn (£9.02bn), equivalent to 12 days of imports, according to their website. Last week saw a continuation of their sales of gold of, possibly, in the region of 10 to 15 tonnes more. 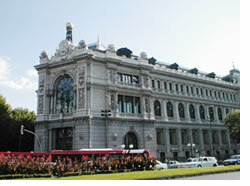 Over the past two months the Banco de España has sold off 80 tonnes of gold. The first reason, that being that money has value because people are willing to accept it as payment is nothing more than a circular argument. It states that money has value because it is accepted. Why is it accepted? …because it has value! The Federal Reserve Bank of Chicago used to publish a pamphlet entitled Modern Money Mechanics , which explains M1, M2, and M3. It is a truly fascinating read. That pamphlet is no longer in print, and the Chicago Fed has no plans to re-issue it. However, electronic copies are available (see link ). Housing is in a relatively deep recession, yet the decline in residential construction employment (not including specialty contractors) has been relatively mild (see Chart 1). Can the US trade deficit continue forever? Will there come a time when foreigners will become less likely to hold US denominated assets? Should such a time arrive, the US Federal Reserve will be forced to increase interests rates to prevent a collapse of the US dollar. This would be catastrophic to the US housing market and US economy as a whole. Imagine an American counterfeiter who uses the fraudulent dollars to purchase Chinese goods. What would you say of such a scenario? Now imagine a US Central Bank that creates money “out of thin air”, places that money into a bank, where upon the bank lends it to an American importer who then uses them to purchase Chinese goods. In Mondays Wall Street Journal , reporter Christopher Conkey wrote a piece suggesting that with 75% of the economy faltering, the other 25% was going to accelerate, preventing the 100% from stalling out. Let's start with business investment. Historically, business fixed investment is a lagging indicator. That is, after residential investment (housing) and consumer spending head for the deck, then business investment follows household spending down. This pattern of business fixed investment spending lagging household spending is shown in Chart 1. On a contemporaneous basis, the correlation between the two series is 0.47. The highest correlation between the series, 0.69, occurs when household spending is advanced (leads) by two quarters. Unfortunately every credit fuelled boom ends in recession. Although no one can really predict the actual timing of a recession one can look out for certain danger signals, the major one being manufacturing. Once manufacturing finds itself in a profits squeeze rising costs start to bite into profit margins it will have no choice but to discharge labour, cut back on investment and reduce output. After a while the manufacturing contraction will reach down into the consumption stages of production, at which point it will be officially declared that the economy has tanked. As Treasury Secretary Henry Paulson continues to drum up interest in direct investment in the United States , he will rely on a set of skills that only a long-time Wall Street pro can truly master. It is part of the investment banker's playbook to perform financial makeovers on questionable companies that they are engaged to sell, a process commonly known as "putting lipstick on a pig." I just got back from The Las Vegas Money Show, where I had a fantastic time speaking with subscribers and catching up on all the latest financial trends. I'm talking about the fact that the underperformance in commercial real estate shares, which I told you about two weeks ago , is getting worse. The Mogambo Guru writes : "I deftly add the $3.7 trillion in spending by the federal government plus the $1.3 trillion by the state governments, and after a few tries I triumphantly announce that we are looking at a cool $5 trillion or more per year! Wow!" My excuse is that I was driven insane by the incessant noise from the sensitive Mogambo Economic Seismograph System (MESS), the recording pens noisily clicking and clacking, all the time clicking and clacking, clicking and clacking as they bang back and forth, erratically scrawling and scratching a frantic graph of financial desperation and doom across that rolling strip of graph paper. The US Federal Reserve will likely respond to more rapid job loss, and to more rapid home sector erosion decline. When they do, expect an official rate cut sequence to resemble that of 2001. As in, sharp & sudden. The signals surround us, that the major powers are in the process of permitting the USDollar to fall. I'm something of the resident bull here at Weiss Research. While Martin and Mike often take a more pessimistic view of economic events, I generally look on the sunny side. The vigorous discussions we have are great reality checks for the whole team. As much as I hate to admit it, some of the things Martin and Mike have been talking about, as well as other recent developments, do look downright bearish to me. The good news is that there are still reasons to be bullish, and plenty of great places to invest. I'll get to that in a moment. The U.S. Department of Labor reported today that the Consumer Price Index or the C.P.I. rose 0.4% on a monthly basis in the month of April. Wall Street was expecting a rise of 0.5% so Bloomberg news reported that the C.P.I. came out lower than expected and that this was a sign that inflation is abating as the economy cools! Inflation for April, as measured by the Consumer Price Index (CPI) has as anticipated fallen back below 3% to 2.8%. This follows last months shock rise to 3.1% CPI, which prompted the governor of the Bank of England to write a letter to the Chancellor explaining why inflation had exceeded the upper boundary of 3%, and guaranteed a rise in interest rates to 5.50% at last Thursdays MPC Meeting (May 10th).